My first outing as a vegan without my wife was a tough experience. 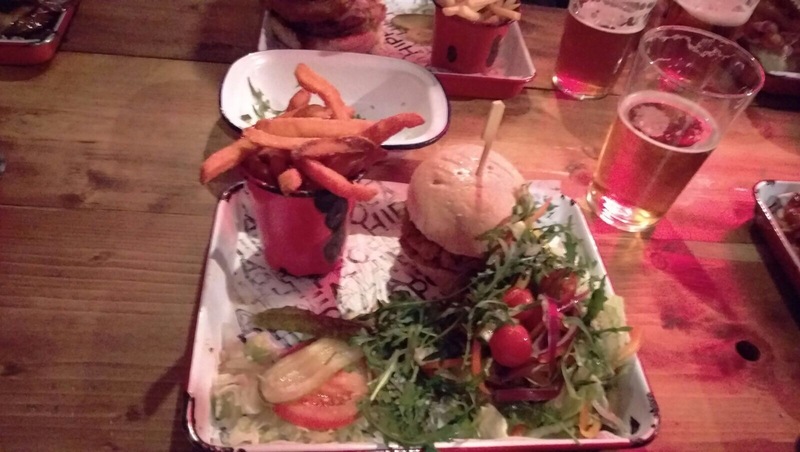 A prearranged evening with friends, organised well before myself and Jo agreed to try being vegan during the month of April, meant I was committed to eating at Newcastle’s The Fat Hippo Underground on Saturday night. The Fat Hippo Underground, for those that don’t know, is a restaurant based on Shakespeare Street in the centre of town which specialises in burgers, fries and slaws. It promises customers that visit its cosy, low-lit underground den the opportunity to ‘sink your teeth into something juicy’ and its menu is unsurprisingly packed with beef, often smothered with cheese, accompanied by mayonnaise soaked salads and slaws and ‘dirty fries’ topped with bacon. Thankfully, The Fat Hippo Underground does cater for those that follow meat and dairy alternative diets. The menu has, as all restaurants do, a dedicated vegetarian section and impressively, a separate menu for gluten and dairy free as well as vegan customers. It is worth noting, however, that when the waiter scurried back to our table with the pre-prepared ‘alternative’ menu, he apologetically pointed out to me the lack of options available to those who don’t want to gorge themselves in what is effectively a meat-eaters paradise. That’s fair enough. The options were indeed minimal, with only the spicy bean burger being suitable for my trial palate, which I could have with either normal or sweet potato fries as well as a plain salad. The bean burger, when it arrived, was noticeably considerably smaller than its beef counterparts being eaten with glee by my six carnivorous friends and if I’m being completely honest, it didn’t have any unique identifying features that could set it aside from your average frozen, supermarket attempt. At the end of the day though, I’m not really complaining. 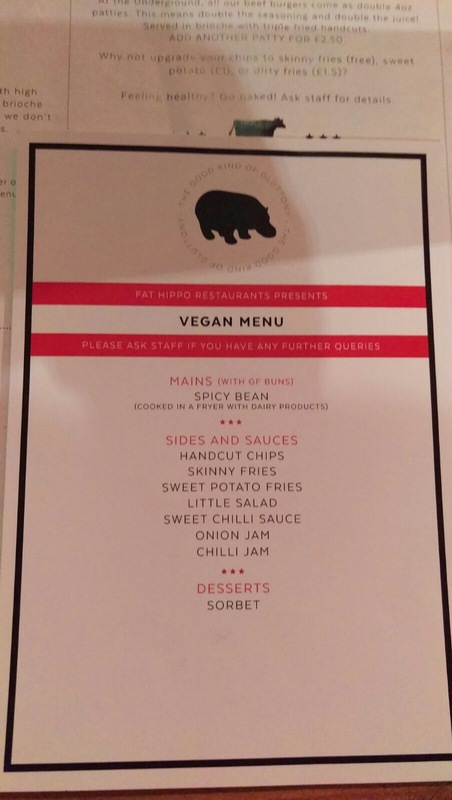 The Fat Hippo isn’t a vegan restaurant and at least makes the effort to cater for vegan guests. A good night was had and I was satisfyingly full and proud not to have given in to temptation this early in the month.